These links will open full product catalogs or product information sheets from our manufacturers and distributors. As a Authorized Dealer, we can provide all these products to you. Look up the products you need, and send us an email with the part numbers. We will reply with pricing and availability, and instructions on how to order! 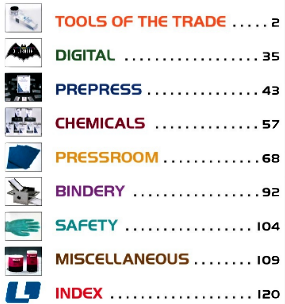 "Our catalog is a valuable reference guide with information and tips to assist you in choosing the correct products for your needs. We have also expanded the use of web links so you can easily access more in-depth product information." Most important! Use our catalog to specify products when ordering from your dealer. "As a Master Distributor supporting your Dealer, our mission is to provide the broadest selection of the highest quality products to the printing and imaging community worldwide! 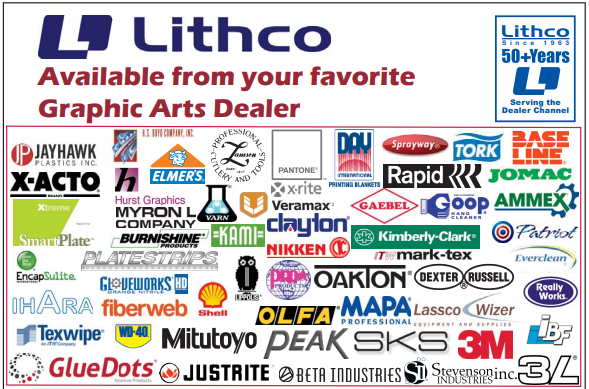 You can find LITHCO on the Internet at www.lithcoinc.com. Visit us often for new product announcements, product tips, and special promotions." Allied Chemical Catalog Link will open as a online flip catalog. Pamarco Roller Catalog Link will open as a online flip catalog. Printer's Repair Parts Catalog Sheets Links will open as a online flip catalog. Tower Products Catalog 2013 Link will open as a online flip catalog. Sprayway Brochure Link will open as a online flip catalog. Rycoline / Sun Chemical Brochure Link will open as a online flip catalog. VanSon Product Guide Link will open as a online flip catalog. Hurst Product Guide Link will open as a online flip catalog. Kerley Ink Product Catalog 2018 Link will open as a online flip catalog. Pantone Color Finder Website Excellent Resource!